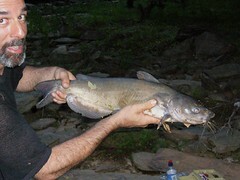 Monster Catfish on Fly Rod!! Thank You Capt Sam Ellis!!!! 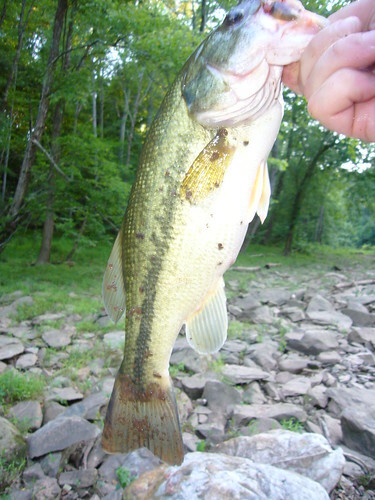 Alex and I went fishing today at one of our favorite sites along Bull Run. Lyme disease and Erlichiosis took a lot out of me this summer so it was good to get out and goof around again along the river. 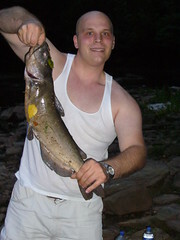 Alex caught two catfish the size of the one I am holding. June 26th 2009. 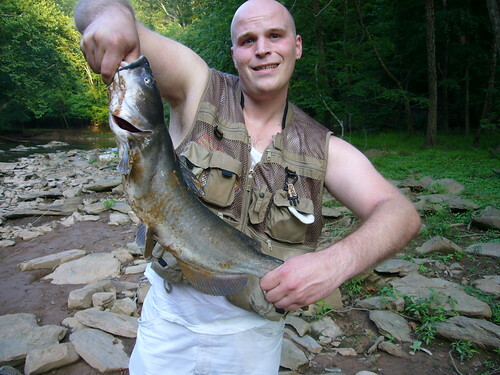 For a couple of weeks now, I’ve been fishing my usual spot at Hemlock Overlook in Clifton. It’s been a fairly wet summer thus far, fortunately the river hasn’t been muddy or high. 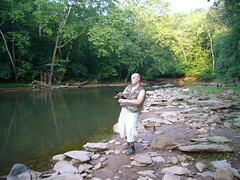 On the 23rd, I had a lot of luck fishing my usual spot directly down the blue trail and to the left along the Fairfax side of the river bank. I had a couple of hits on the fishing lure I was using and managed to land two. 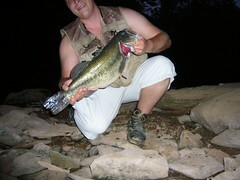 One was average size, but the second was a decent size Largemouth Bass for the spot I was fishing. I had noticed some big carp and yellow perch towards the evening as it was getting darker. Today was hot and humid. 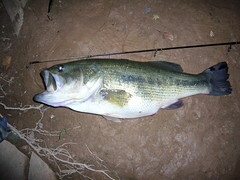 The weather forecaste had called for rain, but I was still determined to go fishing. I thought I would try my luck at a different spot that was still familiar to me. Along the Bull Run is an abonded power station from the eraly 1900’s. 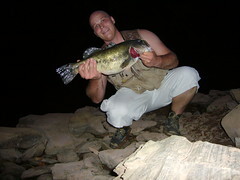 The rapids are fast moving which are ideal for smallmouth angling, which I’ve caught summers before. I decided to cross the river at the shallow end and try my luck on the other side, where there are rocks on the shore and small pools. In the distance I could see thunder clouds, thankfully they bypassed me and I was able to stay in my spot. 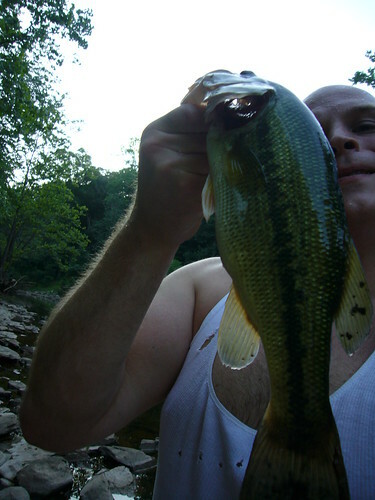 I didn’t catch a bass but I did however have an encounter with a particular species ocasionally seen in the Bull Run River. The horeflys were biting and creating a nuisance as I was trying to cast my lure into the water. At around 8 PM in the evening I started to feel what I thought was another horsefly landing on my shin. I was reeling in my line and wasn’t in the mood for swatting my leg again to get rid of another horsefly. I felt a small peck at my shin and was initally shocked at what I saw. 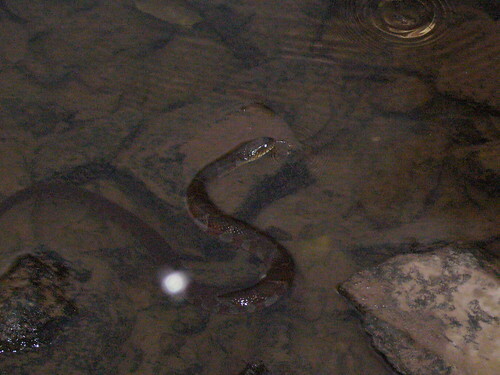 A Northern Water snake, around 3 feet long, was stretched out of the water in a striking position. As I jumped back the snake quickly dove back into the water. The snake had half of his body out of the water, in an S shape almost at a perfect vertical 90 degree angle. My assumption was that the snake was currious as to what kind of object was standing next to the shore. The “pecking” sensation I felt on my shin was in fact the water snake dry biting the hair on my leg. When my leg didn’t move, he stuck his tongue out, most likley to have a taste to determine whether or not my leg was a log or a small animal. When I jumped back he probably got scared and submerged himself again. Shocked and startled, I stood away from the shore and caught my breath, still trying to to process what had happened and wondering if what I saw was a water snake or a Copperhead trying to beach (which I have seen swimming previous Summers most notably in August of 2007 during the drought). When I finally realized what I had seen, I went back to the same spot where I had the encounter with the snake to grab my fishing pole. As I looked over I saw the water snake again skimming along the shore looking for food. I managed to get a couple of pictures of the snake when he came back to shore and when he slid on top of some of the rocks looking for salamanders or small bluegill. Although scary at first, I felt fortunate that I had this unique experience with a Northern Water Snake. 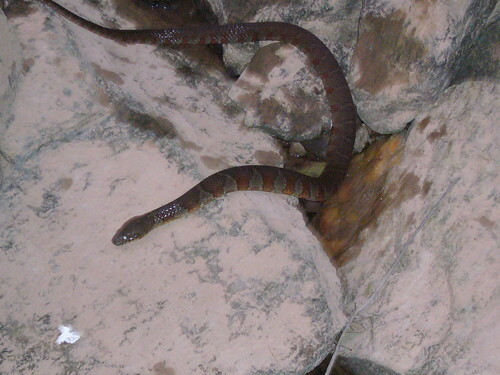 Usually, when I see Northern Water Snakes they are skiddish and try to avoid human contact. 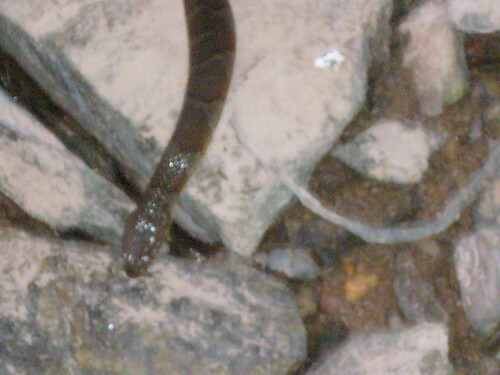 It is also my understanding that they aren’t territorial like other species of water snakes, such as the Cottonmouth. 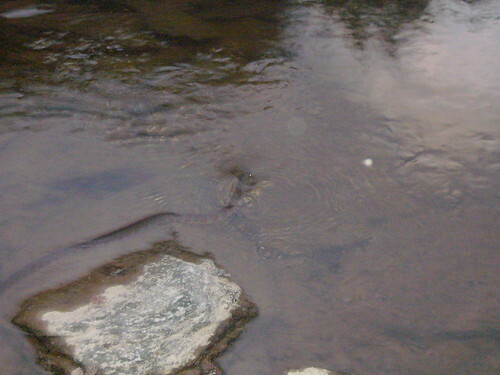 I have never heard of a Northern Water Snake getting close to anyone like it did to me before without being provoked. All and all, eventhough I didn’t catch any bass, I was able to catch an amazing glimpse of a Northern Water snake stretched out of the water in a striking position only centimeters away from my knee pecking it and tasting it. 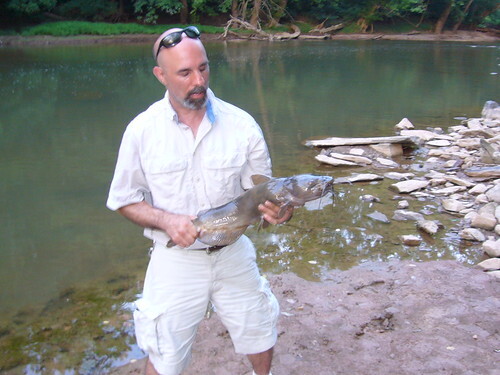 During the month of June and July Alex and I spent several evenings fishing along the banks of Bull Run in the vicinity of Hemlock Overlook. These photos are of Alex and I with some of our catches of the day. 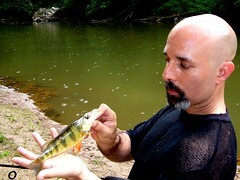 The yellow perch I am holding was caught using one of my favorite artificial baits a Mepps Aglia spinner #2. 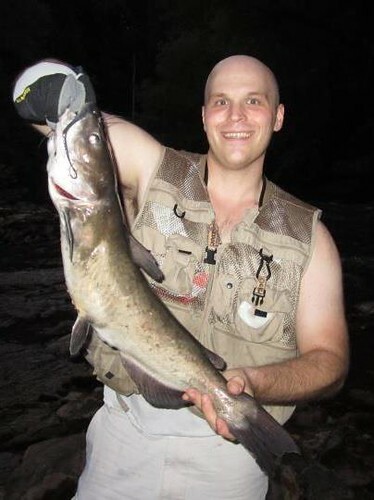 Alex has his own method a jighead and a bobber which landed several decent sized channel catfish like the one shown here.